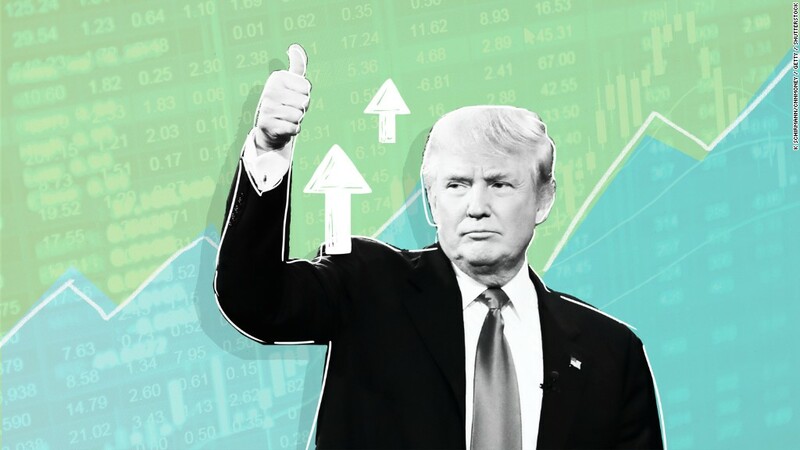 Three months ago, CNNMoney examined six barometers of the economy to gauge how America was doing under President Trump. It's time to take another look under the hood. The good news for Trump is that many parts of the economy are still humming. Trump is taking credit particularly for strong job growth and record high stock prices. The housing market is another bright spot. And the trade deficit has narrowed. 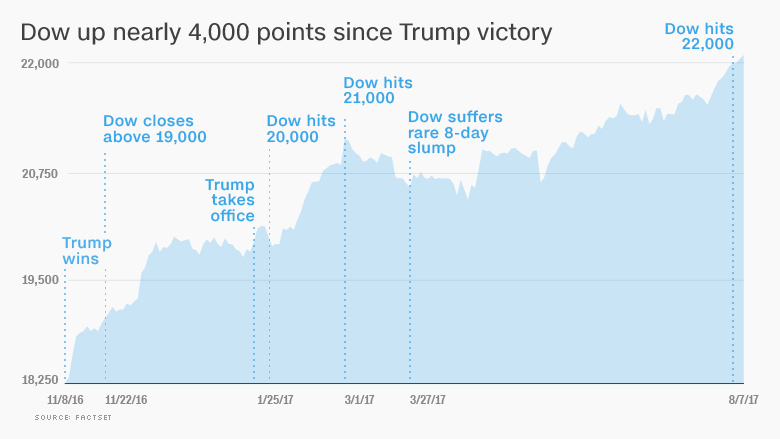 Here's a more detailed look at the economy, 200 days into the Trump presidency. It's hard to find fault with the latest jobs numbers. 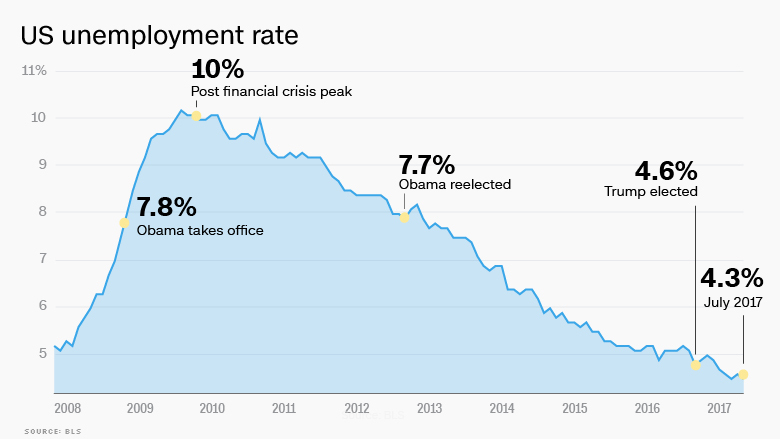 The unemployment rate is 4.3%, a 16-year low. The economy has added more than 1 million jobs since Trump took office. On the other hand, wage growth has yet to really pick up. Employers still don't feel pressure to offer big salaries to attract the workers they need. Average hourly earnings have increased only 2.5% over the past 12 months. The Federal Reserve would rather see 3% to 3.5%. Still, because inflation is low, those wage gains are helping many Americans. The average price for an existing home in June was a record $263,800, or 6.5% higher than a year ago. June was the 64th consecutive month of gains compared with a year earlier. And borrowing money to buy a house remains relatively affordable, despite recent interest rate hikes by the Federal Reserve. The average rate for a 30-year mortgage is just 3.93%, according to Freddie Mac, down from 4.02% three months ago. 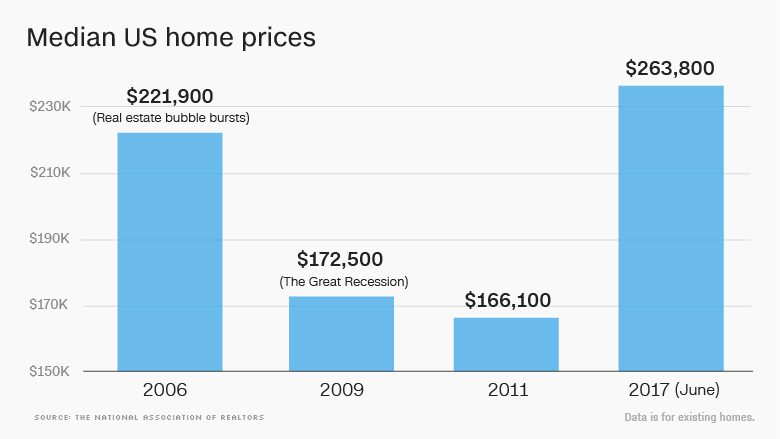 Consumers aren't borrowing just to buy homes. They're taking on debt for cars and using credit cards for lots of other things. Americans had $3.843 trillion in loans outstanding in May, up from $3.766 trillion at the end of last year, according to the Fed. And businesses are borrowing more, reversing a trend from earlier this year. That could be a good sign for Trump and the economy. Consumers can't prop up the economy alone: Companies need to pull their weight and invest. Big stores including Macy's (M), Kohl's (KSS) and J.C. Penney (JCP) report earnings this week, and the results could be lousy. The dominance of Amazon (AMZN) is one reason. But Americans may also be spending less on clothes, toys and other smaller purchases -- even though they're taking out more loans. Retail sales fell 0.2% in June. Economists were expecting a slight increase. And overall consumer spending was up just 0.1% in June. Spending has increased 2.8% over the past 12 months, a bit below the 3% pace many experts feel is necessary to keep the economy on track. Trump wants more consumers -- in the United States and around the globe -- to buy American. And it looks like that's starting to happen. The trade deficit fell slightly in June from three months ago, to $43.6 billion. That's the lowest since just before the election. America's suddenly vibrant oil industry is a big reason the balance is shifting. Thanks to technologies like fracking, the United States exported more crude in June and imported less. Exports to Canada and Mexico rose in June, too, a possible sign that Trump's tough talk is working with America's two big North American trading partners. China is still a sore spot. The U.S. trade deficit with China is up more than 6% this year. An undeniable win for the president. Fears of a market collapse under Trump have proved to be misguided. The Dow keeps hitting records and is up 12% this year. And the blue chips are lagging. The Nasdaq has surged nearly 20% thanks to big gains in Amazon, Apple (AAPL), Google owner Alphabet (GOOGL) and Facebook (FB). For now, Wall Street is willing to ignore the turmoil in the Trump administration. Investors are hoping for eventual changes to the tax code and deregulation of the financial industry. Strong earnings don't hurt, either. Profits for the companies in the S&P 500 are up more than 10% from a year ago.